Marriott Hotels, the signature brand of Marriott International, has welcomed Rotterdam Marriott Hotel to its portfolio. Formerly known as The Manhatten Hotel Rotterdam, Rotterdam Marriott Hotel has undergone extensive renovation of its interiors to meet the needs of today’s traveller. The hotel’s 230 luxurious guest rooms and suites feature modern amentites throughout and are designed with a spacious and upgraded look with tailored solutions that are as inventive as the guest. The lobby has been transformed into a vibrant space to welcome guests and visitors to relax and socialise. “We want our guests to experience forward-thinking, aesthetically pleasing spaces that help foster their inventive nature,” said Matthew Carroll, vice president, Marriott Hotels. “Marriott Hotels has consistently pushed the boundaries of innovation in travel to create experiences that inspire and push our guests’ creativity. The upgraded interiors are complemented by warm and personal service. Rotterdam Marriott Hotel offers 24-hour room service, valet parking and free high-speed internet. The fully equipped fitness centre offers guests the most high tech equipment for any kind of workout they want. An Executive Lounge, Business Centre, and nearly 600sqm of flexible space for meetings and events cater to guests. Through connections, the hotel also has the ability to coordinate with De Doelen International Congress Centre, which can accommodate groups of up to 3,000 visitors. The debut of Marriott Hotels in Rotterdam marks a key moment in the development of the world port city. 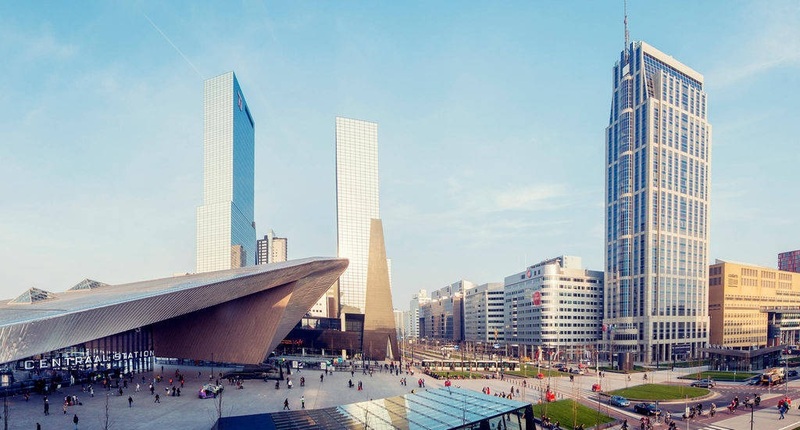 The hotel’s local area and commercial heart of the city, the Rotterdam Central District, has undergone significant change in recent years with the arrival of numerous international companies and extensive regeneration. Marriott Hotels is on a transformational journey to enable its guests to Travel Brilliantly. Guests and travel enthusiasts can visit www.travelbrilliantly.com to experience the countless ways Marriott Hotels continues to meet the needs of today’s travellers. In addition to mobile check-in, checkout, room ready alerts and Mobile Requests, Marriott Hotels is piloting keyless entry with mobile devices at select properties.